Peter King has helped kill thousands of British people! The cacophony of outrage and hysteria engendered by the Wikileaks disclosures has ranged from the embarrassing (the NYT’s Bill Keller admission that he allowed the US government vet his reports) through to the downright bloodthirsty (see calls for Julian Assange’s assassination from the likes of John Hawkins, Marc Thiessen et al). What Peter King neglected to tell Morning Joe, or NBC’s Matt Lauer and Fox News for that matter, is that when it comes to supporting foreign terrorist organizations, the L.I. politician is not only in a league of his own in Washington but is the only living Congressman who can say that he owes his political career almost entirely to the ties he forged with one group of foreign terrorist bombers and gunmen. In the wake of November’s mid-term gains for the GOP, Peter King is poised to take over the chairmanship of the Homeland Security Committee in the new session. That is an extraordinary turnabout for a politician who spent most of the previous thirty years as the most prominent American supporter of the Irish Republican Army, earning in the process the hostility of his own GOP colleagues, the US, British and Irish governments and the attention of the FBI, the Secret Service and Britain’s intelligence agencies, MI5 and MI6. Now the IRA may not have been as fanatical or murderous as Al Qaeda, and these days has exchanged the gun and bomb for peaceful electoral politics, but its three decade war against the British in Northern Ireland was brutal and bloody enough to make the IRA the West’s most feared and formidable terrorist group of its day. Some 1800 people died at the hands of IRA bombers and gunmen between 1971 and 2005 (the equivalent death toll in the US would be 360,000). It made the car-bomb into the modern terrorist weapon de jour and perfected the manufacture of fertilizer-based, home-made explosives of the sort now used routinely by jihadists around the world. Its most prominent victim was possibly Lord Louis Mountbatten, the Queen of England’s cousin who was blown to pieces as he boated off the west coast of Ireland. It came close to assassinating Margaret Thatcher and her entire cabinet in an hotel bombing and IRA activists tossed mortar bombs into the back garden of Ten Downing Street, the official residence of the British prime minister. And for thirty years it held down thousands of soldiers in the lengthiest and most extensive military operation mounted by a post-war British government. As terrorist groups go, the IRA was in the big league and for the British it was their Al Qaeda. Yet during all this bloodshed, mayhem and harm being visited to one of America’s most loyal allies – it was during these years that Thatcher turned Britain into America’s aircraft carrier when Reagan ordered the bombing of Libya – there were fewer more loyal champions of the IRA than the ambitious Nassau County politician. 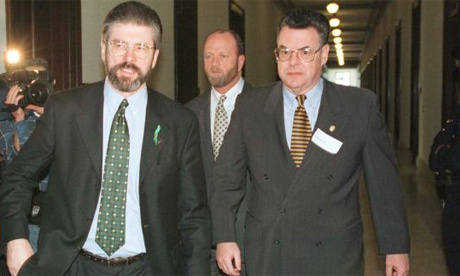 Peter King’s association with the IRA began in 1980 when he joined New York Senator-elect Alfonse D’Amato on a fact-finding mission to Belfast, fulfilling a campaign pledge D’Amato had made to Irish-American voters on Long Island. For an outsider with few family links to Ireland, he quickly made some remarkable contacts with IRA insiders. His closest friends became ‘Anto’ Murray and his wife Lucy who lived in the Lenadoon housing estate in West Belfast, a well-known IRA redoubt. ‘Anto’, a formidable gunman by all accounts, rose to become the Operations Officer for the IRA in Belfast and as such was responsible for ordering and organizing every shooting, killing and bombing in the city. On trips to Belfast, King would stay in their home. When some years later, ‘Anto’ was imprisoned for kidnapping and plotting to kill a suspected British informer, Peter King kept a concerned eye on Lucy, even bringing her to Washington for a vacation and escorted her on a tour of the Capital Building. In an interview with me in 2005, King admitted that he had used Lucy as a model for a heroine in a novel he wrote, one of three potboilers he has produced based on his experiences with the IRA. An indication of how accepted in IRA circles Peter King was can be gauged by the fact that on his trips to Belfast he was a welcome guest in the Felons Club, a drinking haunt whose membership is limited to IRA veterans who had served time in jail for the cause. His attendance at the exclusive club brought him to the notice of British intelligence who thereafter tagged him as a person of interest. His links to the IRA were not confined to its middle leadership. He befriended Bernadette Sands, the sister of the famed IRA hunger striker Bobby Sands and through her got to know Michael McKevitt, Bernadette Sands’ partner and later husband. Michael McKevitt was a member of the IRA ruling body, the Army Council and was also the IRA’s Quarter-Master General, responsible for acquiring, hiding and distributing the IRA’s weaponry. Amongst the operations McKevitt organised during the years that he and Peter King were friends was the smuggling of hundreds of tons of sophisticated weaponry from Libya, a gift from Colonel Muammar Gadaffi. The Libyan leader’s generosity to the IRA was his way of getting back at Thatcher for facilitating Reagan’s bombing missions, one of which had killed his adopted daughter. McKevitt, who later disagreed with the peace process and set up a rival group to oppose the IRA, was possibly the second most significant IRA leader of his day, the Ayman-al-Zawahiri to Gerry Adams’ Osama bin Laden. Peter King, who would visit and stay with McKevitt and Bernadette Sands at their home on the Irish border, had friends and contacts at the very highest levels of the IRA at a time when both the British and American governments had vowed to achieve the organisation’s destruction. Back in America, Peter King linked up with the New York-based IRA support group, Irish Northern Aid, also known as Noraid, which had long been accused by the US, British and Irish governments of funneling cash and guns to the IRA. While most American politicians were deterred by IRA violence from associating with Noraid, Peter King had no such qualms. He spoke regularly at Noraid functions and became friendly with the group’s publicity director, Bronx lawyer Martin Galvin, a figure reviled in respectable circles. Official hostility towards King was ramped up on both sides of the Atlantic. When he tried to attend the trial of IRA suspects in Belfast, the judge threw him out saying that “he was an obvious collaborator with the IRA”. During other visits to courtrooms he was singled out by the police for more intensive body searches. It was much the same back home in America. The GOP in Nassau County tried to muzzle him but failed and he complained that the FBI was opening his mail, including letters from Gerry Adams. In 1984 the Secret Service listed him as a threat when President Reagan visited Long Island to watch a Special Olympics event. None of this was doing him any political harm in Long Island politics however. In fact his staunch support for the Irish cause of independence was doing him nothing but good with L.I. electors. With the support of Irish-Americans, many of them cops, he was elected Nassau County Comptroller in 1981 but his big break through came four years later, a direct result of his support for the IRA. The IRA hunger strikes of 1981 had catapulted Noraid into the big time, making it a major player in New York’s Irish-American political life. The deaths of ten prisoners intensified animosity to the Thatcher government in Britain and radicalized Irish-American opinion like nothing before, filling Noraid’s coffers and boosting its influence. Nowhere was this more profoundly felt than in the selection of the Grand Marshall of the annual St Patrick’s Day parade, a position that brings considerable status and exposure within New York’s Irish-American community. Since 1981 Noraid effectively had the final say in this decision and in 1985, grateful for all his work on their behalf, Noraid threw its weight behind King and he was chosen to lead the parade that March 17th in top hat and tails before an estimated 2 million spectators. In protest the Irish government boycotted the parade. Later that year he was easily re-elected Nassau Comptroller against an opponent who made King’s support of the IRA the main campaign issue and a year later he ran, albeit unsuccessfully, for State Attorney-General. Despite that defeat King had made the jump into mainstream politics and within six years he was the Congressman for New York’s 3rd district. His very first act after election was to jump on a plane to Belfast for a rousing celebration in the Felon’s Club. When the Irish peace process began a year later and the IRA declared a ceasefire, the Clinton White House turned to Peter King for advice. He was the only established American politician who knew anything about the IRA and with that came respectability, a lasting friendship with Bill Clinton and a new status in GOP circles. He hasn’t looked back since. Peter King owes all that he is to his own support for a foreign terrorist group. He accuses Wikileaks of enabling Al Qaeda to kill Americans but he was cheerleader, confidant and friend to the leaders of one of Europe’s bloodiest and most violent terrorist groups. He is the last person who should be trying to paint Wikileaks, or anyone else, with a terrorist brush. Ed Moloney is author of ‘A Secret History of the IRA’ and most recently of ‘Voices From the Grave’. Peter King has hearings, but is he listening? The forthcoming congressional hearings on Islamic radicalisation in the United States promise to be a mixture of high theatre and low comedy. The topic is of compelling importance, but the question is whether it will generate more heat than light. The hearings, scheduled to begin on 9 March, are the brainchild of New York Republican Peter King, whose opposition to Islamic terrorism has more to do with Islam than terrorism. King spent several decades as an avid and very public supporter of the Irish Republican Army and its cause. If there was cognitive dissonance in a conservative American Republican lending his good name to violent Irish nationalists, it never seemed to occur to King – which itself provides a grim foreboding of the probable depth and content of his hearings. The pity is that Islamic radicalisation in the United States is a topic genuinely worthy of serious investigation. Only one Major Hasan need shoot down fellow Americans in his faith’s name to make that clear – and the list of his would-be fellow murderers extends far beyond him. Among the first to tell you this are many American Muslims themselves, who are largely more concerned about the topic than anyone else. “As a Muslim, I think that looking into homegrown extremism is crucial,” says Shahed Amanullah, editor-in-chief of the American Muslim portal altmuslim.com. He points out that “Muslim parents have on several occasions turned in their own children,” as evidence of the seriousness with which the community regards radicalisation. But it’s not people like Amanullah who have the full glare of the media spotlight. Instead, discussion of Islam in American life is increasingly dominated by those who infantilise it in a dozen different ways. On the one side are Presidents Barack Obama and George W Bush, each of whom adopted a role as de facto Islamic theologian and apologist in the wake of terror attacks. On the other side are those who believe that the faith is intrinsically incompatible with democratic liberalism; media charlatans like Glenn Beck; self-appointed pundits like Pamela Geller; and opportunists like Peter King. From the perspective of world history, the King hearings are coming at a historical moment that may, in retrospect, seem somewhat embarrassing. As this is written, Muslim Arabs are throwing off tyrannies across North Africa, and struggling to do the same in the Persian Gulf. Libyans, in particular, are shaming the complacent practitioners of accommodation with dictators from Riyadh to Tripoli to Beijing, as they brave mercenaries and death in the pursuit of liberty. It’s far too early to know what emerges from the Arab world’s convulsions (like the French and Russian revolutions, they could easily end in more and worse oppression), but at the moment, the contention implicit in King’s hearings – that Islamic populations are inevitably problematic to liberal democracy – seems debatable indeed. The fact is that Islamic radicalisation, real as it is, will only be defeated by Muslims themselves. We non-Muslims have no power meaningfully to dictate Islamic discourse and thought, and as non-Muslim Americans, we should not seek it. (In this light, past reports of US government funding of Sufi institutions, on the grounds that they are “moderate”, are examples of ill-informed policy.) The accommodation of varying faiths into our constitutional system has a long history. At the extreme end of the spectrum is the 1887 Edmunds-Tucker Act, which disestablished Mormonism until it abolished polygamy. Perhaps Congressman King believes something similar is needed for Islam in America, and that his hearings will provide the groundwork to make it happen. If so, he is indulging in the same magical thinking that cast the IRA as freedom fighters. The right way to fight Islamic radicalisation in America is to affirm America. This may seem trite, but it is the full truth. At our best, and in our aspirations, we are the nation of opportunity for all, inclusion for all, and liberty for all. Muslims are no less susceptible to the pull of the American dream than anyone else, and as Amanullah notes, the more they are part of the enduring fabric of our national life, the more they will act on their own to defend it – even against co-religionists who are extremists. The truth is that Peter King’s hearings are coming nearly a decade too late. American Muslims are in a different spot now, far from the days when genuinely questionable organisations like CAIR and ISNA ran the show – and so are Muslims worldwide. We need not be naïve about this, but consider the aforementioned Arab revolutions. Consider, too, what Malaysian Prime Minister Najib Razak told me this past Wednesday in Istanbul (from where I am writing), when we discussed the Muslim Brotherhood in a group conversation about Islam and democracy. That’s a Muslim democratic head of state affirming some very Burkean basic principles. We shouldn’t fall prey to the conceit that Muslims abroad speak for Muslims at home, nor vice versa – but might Congressman King’s hearings note that there are grounds for optimism in both camps? Next Americans! STAND UP TO THE TEA PARTY BULLIES!